A study conducted at the First Affiliated Hospital of Chengdu University of Traditional Chinese Medicine assessed the effects of acupuncture on insomnia and attention deficits using outcome measures including the PSQI (Pittsburgh Sleep Quality Index), Schulte grid scale, and ERP (event-related potential). These outcomes were compared with those of healthy control subjects that did not undergo any intervention during the study. The treatment group contained 13 male and 17 female patients, ages 23–44 years (mean age 31.75), with a mean disease duration of 14.05 years. The control group contained 14 male and 16 female subjects, ages 21 –43 years (mean age 29.96). There were no statistically significant differences in demographics between the two groups at this stage. Diagnostic criteria for insomnia included difficulty falling asleep or maintaining sleep and poor sleep quality (experienced at least three times a week for one month or more), significant anxiety levels regarding insomnia and its consequences, and social or occupational impairment due to poor sleep quality. Diagnostic criteria for attention deficits included lack of attention to detail, reduced focus, impaired ability to listen to others, follow instructions, or complete tasks, poor organizational and planning skills, avoidance of complex tasks, forgetfulness, and a tendency to be distracted easily. In addition to the above, further inclusion criteria for the study were a normal function of the brain, kidneys, and other organs, a healthy body weight, no endocrine, immune, or neurological disorders, no infections, and no psychotropic drugs taken in the month prior to the study. Subjects were required to be ages 18 –65 years, have an education of high school or above, competent communication skills, and the ability to give informed consent to participate in the study. Exclusion criteria included insomnia due to narcolepsy, depression, anxiety, fearfulness, epilepsy, chronic pain, and excessive alcohol or narcotic consumption. Pregnant or lactating women, diabetics, patients with hypertension, and those with contraindications to ERP testing were also excluded. Treatment was administered with patients resting in a supine position. Following routine disinfection, needles were inserted perpendicularly to a depth of 10–15 mm and were manipulated using a balanced reinforcing-reducing method. Needles were retained for 25 minutes, and treatment was administered daily for a total of 20 days. The PSQI is a self-rated questionnaire used to measure sleep quality in the areas of latency, duration, efficiency, disturbances, use of medication, and daytime dysfunction. In the control group, mean PSQI scores before and after the study were 5.15 and 4.00 respectively. In the treatment group, mean pre-treatment PSQI scores were 16.20, falling significantly to 4.20 following completion of acupuncture treatments. The Schulte grid test was used to assess changes in daytime attention deficits due to insomnia. The test consists of a grid filled with randomly placed letters or numbers which need to be selected in consecutive order in the fastest possible time. In the control group, the test was completed in a mean time of 12.51 seconds before and 12.29 seconds after the study period. In the treatment group, these times were 32.87 seconds and 12.82 seconds respectively, showing a significant improvement following acupuncture treatment. 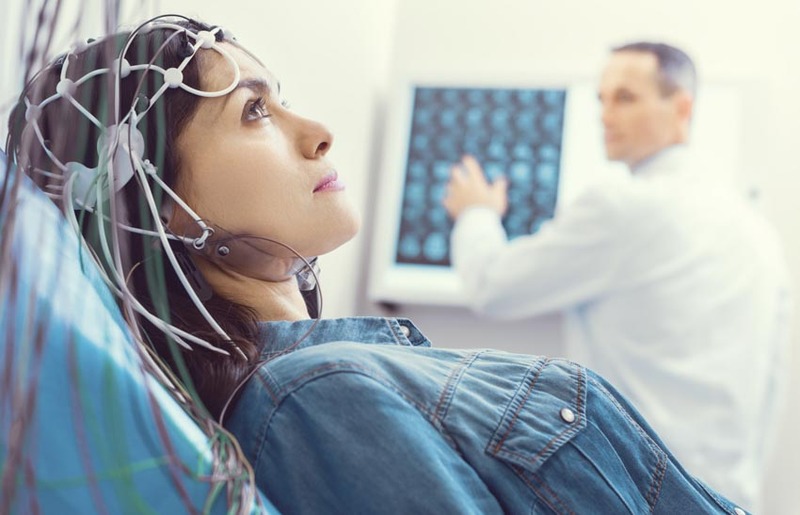 ERP is measured by EEG (electroencephalography) and is used to monitor neural activity during cognitive, sensory, or motor events. It comprises various waveforms which are used to assess latency between stimulus and reaction, with shorter latencies indicating superior cognitive function. Wave amplitude is also taken into account, with increased attention producing larger waves. The waveforms measured in this study included P300 and CNV (contingent negative variation) waves. P300 waves were subdivided into P3a and P3b waves, and CNV was divided into four parameters: A, B, C, S2. At the beginning of the study, mean P3a latency was 298.80ms in the control group, compared with 316.60ms in the treatment group. By the end of the study, these scores were 297.70ms and 300.1ms respectively, indicating significant improvements following acupuncture therapy. Mean pre-treatment P3a amplitudes were 14.52µV in the control group and 5.50 µV in the treatment group. By the end of the study, these scores were 15.32µV and 15.20µV respectively, again showing significant improvements following acupuncture therapy. Mean pre-treatment P3b latency was 308.74ms in the control group, compared with 328.32ms in the treatment group. By the end of the study, these scores had almost equalized to 304.65ms and 304.63ms respectively. Mean pre-treatment P3b amplitudes were 15.72µV in the control group and 5.76µV in the treatment group. By the end of the study, these scores were 15.96µV and 16.76µV respectively, with the treatment group not only showing significant improvements but outperforming the control group in this parameter following acupuncture. CNV parameters also improved significantly in all areas following acupuncture, bringing the scores of the treatment group more in line with those of the healthy control subjects. The results of this study indicate that acupuncture is an effective treatment for attention deficit, a common issue caused by insomnia. Acupuncture improves sleep quality, but also enhances performance in cognitive tasks​, and positively influences neural activity. For more information, contact your local licensed acupuncturist. 1. Ren Zeqin, Yuan Xu, Zhao Rong, Xu Jinlong, Yang Zeguan, Ai Jian, Zuo Zhixiong, Cai Dingjun (2018) “Acupuncture for insomnia attention deficit and the influence of nerve electro-physiology” World Journal of Acupuncture-Moxibustion Vol.28 (2018) pp. 161-166.